South Africa will set the stage for the global launch of Heineken®’s 2016 UEFA Champions League #ChampionTheMatch sessions, and with it the arrival of football superstar Luís Figo to our shores. Each match night, a global superstar will be taking to social media on the @Heineken handle with the hashtag #ChampionTheMatch to host a live talk-show. They will talk about the game and engage with fans and other international UCL legends from pre-game build up, during the action itself and into the post-match debate. 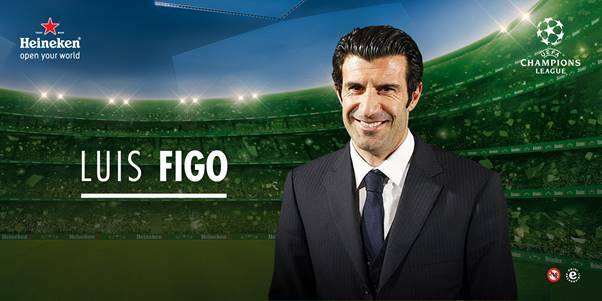 The international legend, Figo, will be traveling to South Africa for Heineken’s first global #ChampionTheMatch session, taking place on 16 February, during the UCL round of 16 Chelsea vs Paris SG match. Figo is one of the few football players to have played for both Spanish rival clubs Barcelona and Real Madrid. The galáctico won a record 127 caps for the Portugal national football team, was named FIFA World Player of the Year in 2001and has several trophy wins to his name, including the UEFA Champions League title with Real Madrid in 2002. “Heineken® South Africa is delighted to be hosting the first of nine #ChampionTheMatch sessions to be held around the world. Our fans will enjoy a truly memorable match night experience. Which is our intention. We want to encourage fans to Champion the Match, and up their Game while celebrating match nights – be that at home or in bars, watching the matches with friends – to create world class experiences,” says Tjeerd Veldhuis, Marketing Manager at Heineken® South Africa. “Heineken® knows that football is about so much more than the match alone – it’s about the experience, and the celebration of the beautiful game. As long term sponsors of UEFA Champions League, we’re enabling fans to do just that by giving them the chance to win tickets to the Final, to win a once in a lifetime opportunity to watch a game with a legend abroad, to win other awesome prizes throughout the campaign, through our win every minute of the match promotion, and of course by bringing superstar Luís Figo to South Africa,” concludes Veldhuis. Join the conversation on Twitter (@Heineken_SA) #ChampionTheMatch or on the Heineken® Facebook page.